That's bizarre, but must be a similar theory to all the billboards for personal injury lawyers on I-80/94 in Gary. There's going to be a wreck on the expressway, eventually. Also shows that Pace is more willing to take the money than promote the service,but since they say it is at capacity,maybe to be expected. Safe to assume the bumper and/or rear of the bus still has Bus On Shoulder or Pace Express signage in compliance with Illinois law? The legal issue has always been the Authorized to Use the Shoulder, which is on this bus. I'm still not sure how Pace basically got around that on the Edens. Maybe this bus can run someone over and give Howard an instant client. That's how his stick figure commercials used to work. My invention, but not as much as his Svengoolie ad. The marketing was the PACE EXPRESS. That, would, of course indicate that Pace is not marketing Edens* except for 6729, which I bet was at the unveiling event. Given the possibility that rules may be different on different expressways,** I don't think Howard Ankin has any interest in marketing AUTHORIZED TO OPERATE ON THE SHOULDER, which is all over this bus. **Despite your post in another topic, I don't think people are walking to work from Skokie to Northbrook, Deerfield, or Buffalo Road, and work is the main destination for 620 and 626. **For instance, the Edens has road signs all over the place, while i-55 only has a few. Probably more signs on edens as its outer shoulder and more conflicts with other vehicles vs left side. I was referrimg to walking from lake forest metra even with more trains still need to get to work site. My comment wasn't directly that Ankin was promoting BOS, but that he had nothing to do with the AUTHORIZED TO USE THE SHOULDER legends on the front and side of the bus; what did was whatever operating requirement still applies on I-55. The promotional aspect is that this bus says Ankin, not Pace Express. Yeah they aren't the best buses in the world, but when you look at the mileage these buses take in, its staggering. Ultimately if they want to play the blame game it goes down to the FTA for allowing the buses to run without replacement the TA is just doing its job with what it has. All the TA can do is run them as little as possible and try to manage as best they can. Nice story though. Lots of TAs have the same issues and graveyards but I was really surprised cali has any diesels at all. As I understand, there are 21 or 22 MCI buses. Are these used exclusively for the Stevenson services? If so, what buses run on southwest expressway routes such as 757, 887, 888 & 895? Also, what division(s) are the last four routes based out of? Once upon a time those two routes had MCIs and then some Eldorado Axxess Express suburban transits. Route 895 runs out of Southwest. Initially that route ran cutaways, then upgraded to the EZ Riders. I don't know if they have since upgraded to the 40ft buses. All of the MCIs are on the Stevenson Express routes and operate out of Heritage in Joliet. Route 895 runs out of Southwest. Initially that route ran cutaways, then upgraded to the EZ Riders. I don't know if they have since upgraded to the 40ft buses. There have been a few reported sightings of 40ft buses on 895, but the route is still almost always run with EZ Riders. - The 757's run transits. At some point the 2390's (when out of West) ran on the I-290 services, but since has been transits. - The 835 (out of Southwest) ran with 2390's, but we should check with webwatch to see if they've moved from the small El Dorkos (at one point, they did have the 1950 series cutaways). - Did the 877/888 routes move to CNG's, and they're not suburbans? Pace South is now 100% CNG equipment. I wonder how those buses are holding up in this subzero deep freeze. Currently -20° F.
The suburbans moved to River in July 2018 (one went to SW). I am on WebWatch and there is this vehicle numbered 9622. It could just be 6322 just trying to play with the tracker, an actual random vehicle, or something else I don't know. 6322 is not this bus actually, it is down south on route 330 around 31st Street right now. That could be any bus. Someone would have to track it and spot it to see what bus it actually is. Sometimes when operators enter their information, a glitch gives the wrong bus number. Maybe 9622 is the last 4 digits of that vehicle's VIN. Some of the vans that supervisors drive are numbered in the 9000s. A similar situation was reported on here a few years ago and that was said to be one of the possibilities. With the extreme cold today, it’s plausible the supervisor might give rides if a service interruption occurred. I must have missed that one. Metra had an announcement that there would be two Pace buses leaving downtown at 4:30 PM due to the Electric District shutdown. Maybe this explains how they were able to get two buses available during rush hour. 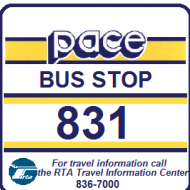 There was an email at 8:30 this morning that Pace had "weather-related delays, especially on Routes 307, 308, 318, 322, 331 and 608".